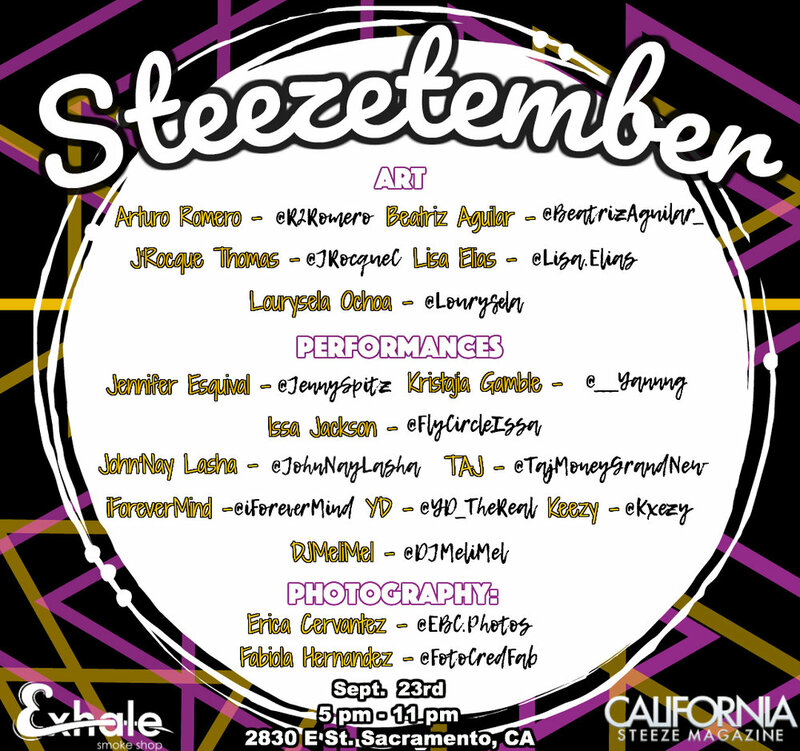 This Evening, September 23rd, California Steeze is having its FIRST EVER "STEEZETEMBER" event in downtown Sac. California Steeze Magazine is a company that bleeds California Love! We produce California based apparel, have one of the top advertising platforms and cultural magazines, and most importantly we support local art and talent! In our first "STEEZETEMBER" event, we are showcasing live music, local artists, spoken word. We are providing everything you need to have a dope evening! Instead of being lazy at home, grab your friends, grab your wife and come out to the most lit local event of the year! Some of our local talent include well known artists such as Arturo Romero, and Beatriz Aguilar, with performances by Jennifer Esquival and Issa Jackson, and the fun doesn’t stop there, we will be introducing those in attendance to much more talented artists who you wont want to miss. "STEEZETEMBER" is an event we put on to represent the best up and coming talent in Sacramento. We want to do it in a way that supports their efforts to get out there, and to introduce you to talent that deserves your attention. So show up and show out for our first "STEEZETEMBER" and be sure to take plenty of Instagram selfies, snapchat videos, and Facebook Live posts and hashtag #STEEZETEMBER to show everyone else what SACRAMENTO VERSUS EVERYBODY truly means! This event is 18 and older, so be sure to leave the kiddies at home and come turn up with us, Ano and DJ Meli Mel in the mix. If you spend every weekend at home and are looking for a change of pace, there's no reason to make this complicated. Come hang out with us at "STEEZETEMBER", it's a night you wont want to miss. California Steeze Magazine provides entrepreneurs, artist's, musician's, and businesses the ability to market their business or brand through our marketing platforms and online platforms.